The problem is making sure my mail is not marked as spam by the major MTAs out there, gmail and hotmail both mark my mails as spam. This entry was posted in Computer, Mail, Murmuring, Network, Spam and tagged dkim, dmarc, dns, ip, mail, open, relay, server, smtp, spam, spf, system, tls on August 15, 2016 by Gea-Suan Lin. [...], but the lack of AES-NI instructions on the CPUs cause a significant slowdown. To maximize the amount of relayed data, it is normal to simply run multiple instances of the program, up to two per IP address. My final goal was to beat the Tor speed record, which was at roughly 200 megabytes per second. [...] He set up a server with my relay and within a few days we had broken the Tor speed record with a nice 250 megabytes per second, effectively maxing out the network link. CPU usage was at a nice 60% across 12 cores. But his relay also suffered from the memory issues and had to be restarted every few days. 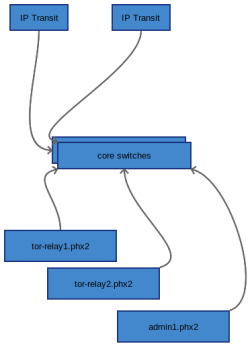 This entry was posted in Computer, Murmuring, Network, P2P, Programming, Security, Software and tagged aes, cpu, go, golang, p2p, performance, relay, tor on February 16, 2015 by Gea-Suan Lin. A single organization shouldn’t be running more than 10Gbps of traffic for a middle relay (and 5Gbps for an exit node). A new Tor instance (identified by its private/public key pair) will take time (up to 2 months) to use all its available bandwidth. A Tor process (instance) can only push about 400Mbps. This entry was posted in Computer, Murmuring, Network, P2P, Security, Software and tagged mozilla, node, privacy, relay, tor on January 30, 2015 by Gea-Suan Lin.